in cooperation with the THIRD MAN MUSEUM. Vienna 1945-1955: 30 percent of the city lie in ruins. A city between hunger and reconstruction, between occupation forces and demarcation lines, between East and West. Stories from "rubble women" and the "Four in a Jeep". On our walking tour we see the most important sites of post-war Vienna. You learn about backgrounds in an international context: Why was Vienna the only city in the world where the Allied Powers managed a zone together? Why did the Allies treat Austria another way than Germany? Why was Austria not divided into an Eastern and a Western state? Original photo material from the Third Man Museum gives you an idea of the situation in Vienna at the time. 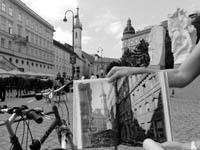 This tour includes a visit to the exhibition "Post-war Vienna" in the Third Man Museum.